Permian strata form a narrow outcrop in the Vale of Eden, with small outcrops marking the periphery of the East Irish Sea and Cheshire basins. To the east of the Pennines the outcrop runs from Sunderland to near Nottingham. Limestone escarpments of the lower Permian have been used effectively as defensive sites for ancient castles such Bolsover. In the south-west peninsula, Permian strata crop out in the valley of the River Exe southwards to Torbay. Together, the Permian and early Triassic sandstones are known as the New Red Sandstone Supergroup. 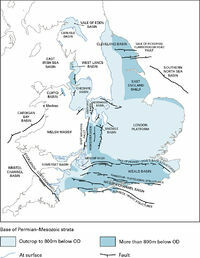 Permian and Mesozoic basins of England and Wales. P785821. In early Permian times, Britain was situated in tropical latitudes north of the Equator within the large continental mass of Pangaea that stretched from the south pole well into northern latitudes (Figure P785800e). The climate was hot and dry, a continental desert perhaps something like Death Valley today. Tropical seas encroached, but far to the south on this continent glaciers were building up around the south pole and the second great glacial period that affected the planet was developing. It is estimated that perhaps 96 per cent of marine species became extinct in the Permian, and land-based fauna and flora also suffered severely. The Variscan unconformity marks the base of the Permian strata. This is one of the most significant unconformities in British stratigraphy, and gives an idea of the extent of the erosion that followed uplift at the end of the Variscan Orogeny. Traced northwards from Nottingham where the Permian rests on upper Westphalian, the base cuts down through Namurian and most of the Visean sequence, and in the Welsh borders south of Oswestry it cuts across the Silurian to rest on Ordovician strata. Crustal extension that was set in motion after the Variscan Orogeny and eventually resulted in the opening of the Atlantic Ocean also produced a series of rift basins (Figure P785821). 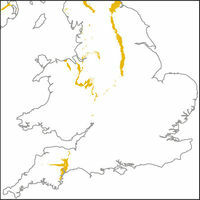 These include the East Irish Sea Basin, the Cheshire Basin and sub-basins of the Midlands, Worcester and Wessex–Channel basins, as well as the North Sea graben. The landscape of the early Permian was one of rugged hills with scree and talus accumulating against steep active fault scarps and alluvial fans deposited by flash floods and ephemeral streams, but the dominant influence on sedimentation was aeolian. Prevailing winds were from the east (today’s direction ignoring continental rotation) and red cross-bedded sandstone preserves part of the dune fields of the period. Thick desert breccias, known locally as brockram, are preserved around the Lake District and in the Vale of Eden (Plate P220615). The sandstones (Collyhurst Sandstone Formation) are more widespread, and together make up the Appleby Group (P1). Equivalent strata are preserved in the Cheshire (Bridgnorth Sandstone Formation), Stafford and Worcester basins and in the Vale of Clwyd where the Kinnerton Sandstone Formation (P1) reaches a maximum thickness of 1150m just offshore forming a wedge that thins away from the basin edge. Brockram, Appleby Group, Saltom Bay, Whitehaven. P220615. To the east of the Pennines, the Lower Permian strata are much thinner, about 150 to 200m, and were deposited on the East England Shelf, a gently undulating peneplain on the western edge of a subsiding basin that extended across the southern North Sea. 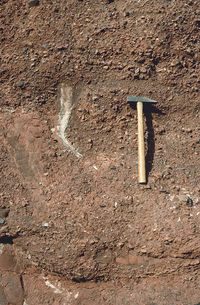 Some breccias are present but most of the strata that are preserved originated as sand ridges or draa; these are the basal Permian sands (Yellow Sands Formation). Near Nottingham, the sand gives way to breccia, deposited as piedmont gravels on a wind-swept desert landscape. Late Permian palaeogeographical sketch map. P785822. In late Permian times, a rise in sea level caused flooding of low-lying areas. The Bakevellia Sea in the west covered an area approximately coincident with the East Irish Sea Basin, coastal areas of Lancashire and southwards towards Manchester and into the Cheshire lowland. The Zechstein Sea encroached from the east and the inferred shoreline lay a little to the west of the present Permian outcrop (Figure P785822). It is not clear if the two oceans were ever connected. Upper Permian strata show a strong cyclicity; four cycles are identified in the Cumbrian Coast Group in the west, and five or more cycles may be present in the Zechstein Group in the east. The cycles are interpreted as the result of flooding, possibly related to glacio-eustatic sea-level changes, and subsequent evaporation as water levels subsided in enclosed basins, marginal lagoons or playa lakes. At the base of the Zechstein Group is a thin bituminous dolostone (Marl Slate Formation) with an unusual mineral assemblage and distinctive fish and plant remains. Carbonate formations (now largely changed to dolomite) represent deposition in tropical seas of fairly normal salinity and fossils include reef building algal stromatolites (Plate P667869), bryozoans and bivalves. With evaporation and increase in salinity, the precipitation of anhydrite/gypsum and halite is followed by magnesium or potassium salts. Stromatolites in the Cadeby Formation, near Aberford, Yorkshire. P667869. 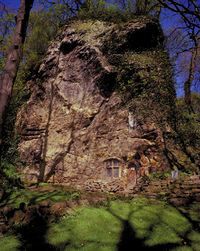 Cadeby Formation (Lower Magnesian Limestone): the Chapel of Our Lady of the Crag has been hewn out of cross-bedded ooidal limestone, Knaresborough. P222612. Upper Permian limestone forms a near-continuous and well-drained escarpment to the east of the Pennines, and has been a source of an attractive building stone along its entire length. The Cadeby and Brotherton formations (P2; formerly Lower and Upper Magnesian Limestone and now part of the Zechstein Group; Plate P222612) are predominantly shelf carbonates, and there is ample evidence of discontinuity and erosion. Red-brown Permian mudstone (P3; Edlington and Roxby formations) separates and overlies the limestones. Anhydrite/gypsum that occurs within the mudstone can cause subsidence problems where dissolved near the surface. The Lenton Sandstone Formation of the Nottingham area is a fluvial–aeolian sandstone at the base of the Sherwood Sandstone Group that is partly Permian in age. To the west of the Pennines (Cumbrian Coast Group; P3), the Upper Permian StBees Evaporites Formation has been mined extensively for gypsum and anhydrite. It passes up into the StBees Shales Formation, and towards the edge of the basin in Lancashire and Cheshire the lateral equivalents are the Manchester Marls and the upper part of the Kinnerton Sandstone Formation. The Eden Shales are preserved to the east of the Lake District and may hint at a connection between the Bakevellia and Zechstein seas, via the Stainmore depression. Heavitree Breccia of the Exeter Group. Note the small Neptunean dyke infilled with sand and truncated against the overlying bed, Exeter. P213896. In the south-west of England, the breccias of the Exeter Group (P1) contain fragments and clasts that trace the history of the unroofing of the Dartmoor Granite, emplaced about 280Ma. The early breccias contain almost exclusively Carboniferous clasts, the younger breccias contain a mix of Devonian clasts and fragments derived from the nearby granite with feldspar crystals appearing near the top (Plate P213896). Karst that developed locally on the surface of the underlying Carboniferous limestone is infilled with breccia. Overlying fluvial sandstones (Shute Sandstone Formation) rest unconformably on the breccias and pass up into dune sandstones of the Dawlish Sandstone Formation. Near the base of the Exeter Group, mafic lavas, dated at 291 to 282Ma (Carboniferous to Permian), were erupted just before the emplacement of the Dartmoor Granite. 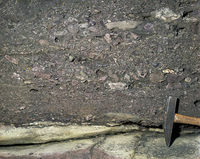 The lavas have a geochemical signature that indicates an origin within a continental plate; lamprophyres, rhyolites and agglomerates are also present.